Club nights: Second Wednesday of Month. 8pm Clubrooms / Parts Shed: Litany Street, Cromwell. Minutes of the last Committee Meeting The minutes of the last committee meeting are displayed on the bulletin board in the Club rooms. Please read them. Next Committee Meeting The next committee meeting will be 1 May 2019 at 7:30pm in the Club Rooms. All club members are welcome to attend. NOTICES 10 April — Club Night— 8 pm. Technical evening, so bring along any questions or problems and Graham will answer them. 27 April — GOLDEN TIMES RALLY. Please see the details and entry form on page 12 & 13 April Sunday Run — There will be no Sunday Run for April due to the Golden Times Rally on 27 April All British Day — Due to the difficulty of working this event around other events, it was decided to leave it out for this year. Get your vehicle entries in now for the COVCC Golden Times Rally and for the Wheels at Wanaka . Copy deadline for next edition FIVE days after meeting day. Stories and photos unable to be used in next edition will be saved for later editions. The opinions and information presented in this newsletter are those of the authors and are not necessarily those of the club or its officers. No responsibility is accepted for the accuracy of information or opinions expressed. Arrowtown Autumn Festival, Golden Times Rally ( details and entry form on pages 12 and 13) May 11th Sunday run to Omarama ( Murray George ) June 1st The Queens Birthday run to the West Coast. June 12th AGM August 17-18th -Combined Rally Central Otago. John Martin August 25th - Daffodil Rally to raise funds and awareness for the Cancer Society. September 28th Blossom Rally Left: Mt. Somers General Store en route to Greymouth. Right: Lake Hawea on the way home from Greymouth. It doesn’t get much better than this. Chairman’s Report There will be no Chairman’s report for this month. Moped Rally We held the Annual Moped Rally on Sunday 24th March 2019. Everyone met at Tarras at 10am, most people went into the Café and had a coffee once they had unloaded their bikes, some had been up at 5am to arrive at Tarras by 10. Twenty six keen Moped and Scooter riders plus 3 lady support crew came from Christchurch, Geraldine, Oamaru, Balclutha, Wanaka, Queenstown, Gore and Dunedin. One lady rider. The instructions took us round Ardgour Road out to the main road then to Maori Point Road, where our first place of interest was at Wayne Marsh’s place. Wayne has a great big shed with MG’s, this is a lovely property and we had our box lunch there. From here we when down Maori Point Road to Bell Lane, heading back towards Tarras. Next place of interest was Mr Parcells place — lots of treasures here, tractors, farm equipment and a different selection of cars. Heading back to Tarras for another coffee and away home. The weather was perfect, no wind. Thanks John & Wendy Martin Photo by John & Wendy which they titled “Old bikes and old blokes”. Editors Comments Our guest speaker last club night was Robert Duncan who gave us a very interesting talk on his last visit to the USA. Included were some very interesting insights into the Amish way of life. He also gave us a quick look at his next project, a very rare Chrysler. This is an advance warning that we have our AGM coming up in June and this is the perfect time to start thinking about what you would like to see happening in the club and who you would like to see in the various offices. Just because a position has not been vacated, it doesn’t mean you can’t elect someone new. The MG Rally and the Alvis Rally were apparently a great success, we will hopefully have some reports on these in next months Puff’n Stuff. I am going to use the remainder of this page for a few photos of the scenicland rally. Cheers for now. Don Right: Not again? Below: That rope looks shorter as the kms per hour increase. Below left and right: The logistics of turning about 40 cars around on a road we shouldn’t be on. 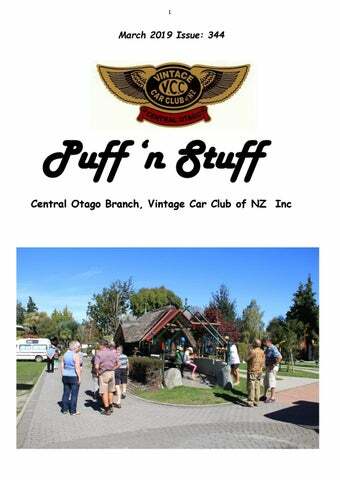 Saturday 27th April 2019 The Central Otago Vintage Car Club invites you to join the Autumn Festival in Arrowtown and to take part in our annual Golden Times Rally. As usual the Rally will have a strong emphasis on a relaxed social time with the chance to drive through some of the countryâ&#x20AC;&#x2122;s best scenery. Period Dress to the era of your car is encouraged. There will be awards for your participation. Rally entrants will meet in the main street of Arrowtown, where the cars will be displayed from 8.30 am (access down Wiltshire Street). Morning tea will be from 9:00 am on the Main Street Green. Rally packs will be distributed there. Cars will depart from the main street starting point at one minute intervals from 10:15am finishing at the lunch venue. Lunch will not be supplied and so you will need to bring a picnic lunch. After lunch (or after the parade, for those taking part) you can proceed in your own time to Cromwell taking in some festival activities or visiting some of the following points of interest on the away. Gibbston Tavern, Gibbston Valley Wineries, Highlands Cafe Bar (great views of the track) or grab some fruit at any of the Cromwell Orchards. Total $ ………………. 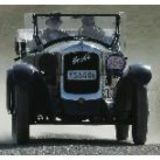 Entries close: 15th April Cheques payable to the Central Otago Vintage Car Club or to Bank a/c 06 0921 0035742 01 with your name as reference. All Correspondence to Rally organiser: Karelan Doran. Email: karelandoran@gmail.com 101 Morven Ferry Road, Arrow Junction, 9371. Dunback All British Day Sunday March 10 the Prydes and the Yeamans, in Jaguar XK150 and Triumph TR2 respectively, left Wanaka with tops down heading for Dunback. Morning coffee at Lauder and then back on the road reaching Dunback around noon. Great drive with only a light mist for the last 15 minutes. There was possibly 75 to 100 cars attending. Cars from the Rootes Group were the featured vehicles but there was a good representation across all the British marques although Jags outnumbered the others. At the prize giving both the XK150 and the TR2 received an award and peopleâ&#x20AC;&#x2122;s choice went to a very nicely restored Morris Minor Pickup. Although the weather at Dunback was overcast with a few light hearted attempts at mist, it was a great day. The trip home was good with three of us in tandem this time, the XK150 then an XK120 and the TR2 playing tail-end-Charlie. The weather improved as we got further inland and it proved to be a great afternoon drive. The XK120 left us at Ophir and we carried on to tea at Luggate and then home. Parts Dept. The Parts Department is the place to go if you are looking for that electrical and related bits; points, condensers, spark plugs, distributor caps including some magneto caps, and that is only part of two shelves. A lot of this is NOS . At the working bee the floor in the tunnel barn has been cleared, there are quite a few bits for Triumph 2000 s and Hillman hunters including instruments Carburettors manifolds, steering racks, also quite a lot of BMC stuff. There are filters, fanbelts, gaskets, motors, gearboxes, new speedo conversion drives ie mph to KPH make your car 20% faster! We are selling a quantity of 200 universal beam (RSJ) in good condition. 3x 6m , 6x 3.1m, 4 x 3,9m $25per m or $1000.00 the lot. Build mum a clothesline. Puff N Stuff DISPLAY ADVERTISEMENT RATES From June 2017 Full Page $300.00 Half Page $ 150,00 Quarter Page $ 75.00 Contact the Ed for info.